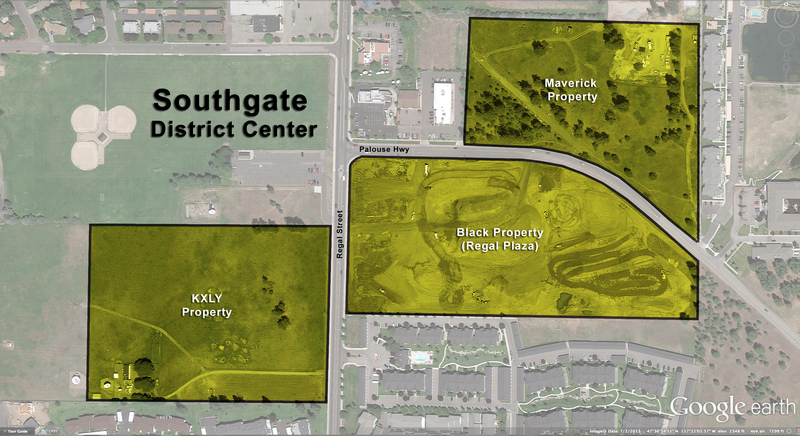 The Southgate District Center is a collection of three properties totaling 45 acres located in the heart of our neighborhood at the corner of Palouse Highway and Regal Street. The District Center was created as the result of a Comprehensive Plan amendment in 2005. The District Center (CC2) zoning is the result of the implementation of the City’s Centers and Corridors planning guidelines and a compromise with the residents of Southgate Neighborhood who objected to commercial zoning and big box development in the area. The three properties that make up the District Center are subject to specific zoning requirements and Developer Agreements that emphasize pedestrian oriented development and mobility through the 45 acre District Center. We will be posting a primer on the District Center Developer’s Agreements and the Integrate Site Plan. The first project to be built in the District Center is Regal Plaza, a 15 acre shopping center that will host a new Target store and other retail shops. The SNC Land Use Committee was created to monitor the development and comment on behalf of the Southgate Neighborhood in matters relating to the completion of the District Center.